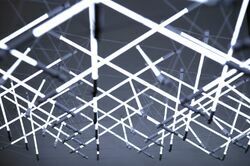 Read here about an artist and architect active in the exploration of tensegrity concepts and structures. Michal Maciej Bartosik works as an architectural designer and conceptual artist, with interests in tensegrity, urban dynamics and social spaces that explore and challenge cultural perceptions of continuity and stability. His initial motivation was to produce a light fixture using only its light source (lamp) and electrical conduit (wire). 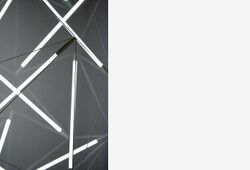 Since these are the ad minimum elements required for a light, and as they often depend on a physical armature to supply its fixture, tensegrity was a structural means by which lamp and wire constitute both the light and the fixture. In the process Bartosik realized the role of gravity in his structural training: the law of gravity dictated to build up through a system of strata, stacking one element onto the other. Tensegrity works quite differently. It's as though it cannot distinguish between the up and the down. Each element regardless of it particular order in the structural sequence has an immediate effect on all of the elements below it as well as above. ...perhaps most poetic is that the system requires a degree of 'tuning' to stiffen by adjusting the chords, not unlike an instrument. Our western perception of social spaces however codified, can too be reduced to this gravitational paradox between structural conventions. It was never my intention to work in light. When I began to experiment with geodesic domes and their platonic order, light, or rather the fluorescent tube became a material suitable to convey the structure's logic and efficiency to distribute loads and forces. This was the genius of Fuller's domes, that they exhibited properties of structural correlation so that tubes of glass having a limited resistance to compression and tension and almost none to resist moment forces could act as its integral structural components. If ever we needed a physical model of egalitarianism, the geodisic dome serves as a perfect example. Bartosik was born in Walbrzych, Poland. He studied Architecture at the University of Toronto School of Architecture and Landscape Architecture, and at the Politechnika Krakowska in Krakow. His work spans his mutual interest in Urbanism, Architecture, Art and Design. He has designed numerous artist run centers in Toronto: Trinity Square Video, (Mercer Union and LIFT as a member of Team Project). His work has exhibited internationally. Bartosik is a guest critic at the University of Toronto John H. Daniels faculty of Architecture, Landscape, and Design. His furniture design is represented by Klaus by Nienkamper. His recent work and accomplishments include a 2013 show at the Design Exchange in Toronto, a SPOK/Kabinet architektury in Ostrava, Czeck Republic Solo exhibition, and his 'The Pretzel Chair' being selected as one of 50 finalists in a competition held by the Battery Conservancy In New York City. Bartosik has executed many projects involving tesnegrity, particularly working with fluoresecent lighting fixtures. For details, see Lighting Fixture. This page was last edited on 18 November 2018, at 04:36.